Sodium fluoroacetate is a chemical compound that is a poison for many organisms. Pesticides used kill rodents sometimes contain Sodium monofluoroacetate. Sometimes the chemical substance is used as a marker for cancer cells in Positron emission tomography. TO act as a marker, only very small quantities of a substance are needed. For this reason, the toxicity of Sodium fluoroacetate is not a problem. Fluoroacetate occurs naturally in at least 40 plants in Australia, Brazil, and Africa. It was first identified in the poison leaf (gifblaar) Dichapetalum cymosum by Marais in 1944. 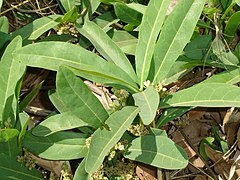 As early as 1904, colonists in Sierra Leone used extracts of Chailletia toxicaria which also contains fluoroacetic acid or its salts to poison rats. Several native Australian plant genera contain the toxin, including: Gastrolobium, Gompholobium, Oxylobium, Nemcia and Acacia. ↑ Marais, J. C. S. (1943). "The isolation of the toxic principle "K cymonate" from "Gifblaar", Dichapetalum cymosum". Onderstepoort Journal of Veterinary Science and Animal Industry 18: 203. ↑ Marais, J. C. S. (1944). "Monofluoroacetic acid, the toxic principle of "gifblaar" Dichapetalum cymosum". Onderstepoort Journal of Veterinary Science and Animal Industry 20: 67. ↑ Renner (1904). "Chemical and Physiological Examination of the Fruit of Chailletia Toxicaria". Jour African Soc. : 109. ↑ Power, F. B.; Tutin, F. (1906). "Chemical and Physiological Examination of the Fruit of Chailletia toxicaria". Journal of the American Chemical Society 28 (9): 1170–1183. doi:10.1021/ja01975a007. ↑ Vartiainen, T.; Kauranen, P. (1984). "The determination of traces of fluoroacetic acid by extractive alkylation, pentafluorobenzylation and capillary gas chromatography-mass spectrometry". Analytica Chimica Acta 157 (1): 91–97. doi:10.1016/S0003-2670(00)83609-0. This page was last changed on 27 October 2013, at 13:58.